A Year Later, Syria's Chemical Weapons Are Gone, But Siege Remains : Parallels The Damascus suburb hit by a deadly chemical weapons attack a year ago remains surrounded by Syrian government forces who are still trying to squeeze the rebels out. Syrians killed in a chemical weapons attack were taken to a field hospital in Eastern Ghouta, in the suburbs of Damascus, one year ago on Aug. 21, 2013. More than 1,400 people were killed in the attack blamed on the Syrian government, which continues to besiege the rebel-held area to this day. In the year since a major chemical weapons attack in Syria, President Bashar Assad has handed over all of the declared arsenal, and the U.S. says it has destroyed the weapons. However, this has not fundamentally weakened Assad. He remains firmly entrenched in the capital, Damascus, though his army has lost ground to the Islamic State, the extremist group that now holds large parts of the north and the east of the country. The chemical weapons attack, carried out with sarin gas, took place in the suburbs of Damascus, known as Eastern and Western Ghouta, on Aug. 21 last year, and a U.S. investigation found it killed more than 1,400 people. Survivors say the destruction of the Syrian chemical arsenal is no consolation for the loss of loved ones or the harsh, ongoing military siege by Assad's army. Majd Al Deek, 26, a photographer and activist, was in the Eastern Ghouta area when he got word that there had been a chemical attack. He and his friends rushed to the affected towns in the sprawling rebel-held suburbs. "We didn't realize at first that the gas would affect us too," Deek says, adding that he lost seven out of eight of his fellow activists. They died, he says, after handling the toxic bodies and ferrying those with the weakest heartbeats to medical clinics. Deek photographed the victims body-by-body in repeated, frantic trips to the scene. He calls the event a turning point in Syria's revolt against Assad that began in 2011. "The air was poison," he says. "When we went to the locations where the bodies were gathered, I couldn't even fit them all in my camera frame." Syrians inspect a site hit by what they said were airstrikes carried out by President Bashar Assad in the Eastern Ghouta area on Aug. 3. Assad's forces continue to besiege the area near Damascus, which is still controlled by rebels. Entire neighborhoods were wiped out, leaving no one to identify the victims, who were buried in mass graves. A U.S. government assessment determined that 1,429 people, including 426 children, were killed. The White House said it assessed with high confidence that the Syrian government was the perpetrator. Human Rights Watch, the U.S.-based group, said the rockets and launchers used "strongly suggests that these are weapon systems known and documented to be only in the possession of, and used by, Syrian government armed forces." Before the attack, President Obama had warned Syria against using chemical weapons. "A red line for us is we start seeing a whole bunch of chemical weapons moving around or being utilized. That would change my calculus. That would change my equation," the president said. In the days after the attack, Obama considered airstrikes against Syria, but ultimately decided against it. His administration has been providing limited, covert training for so-called moderate rebels, and the president is now seeking $500 million to step up the assistance. However, Obama has so far refrained from direct U.S. military involvement in a war that's now in it's fourth year and features multiple competing factions. Meanwhile, many in the opposition have been bitterly disappointed by the U.S. response to the chemical attack. "From the beginning of the revolution [in 2011] we heard that chemical weapons were a red line," Deek says. "But they were used. 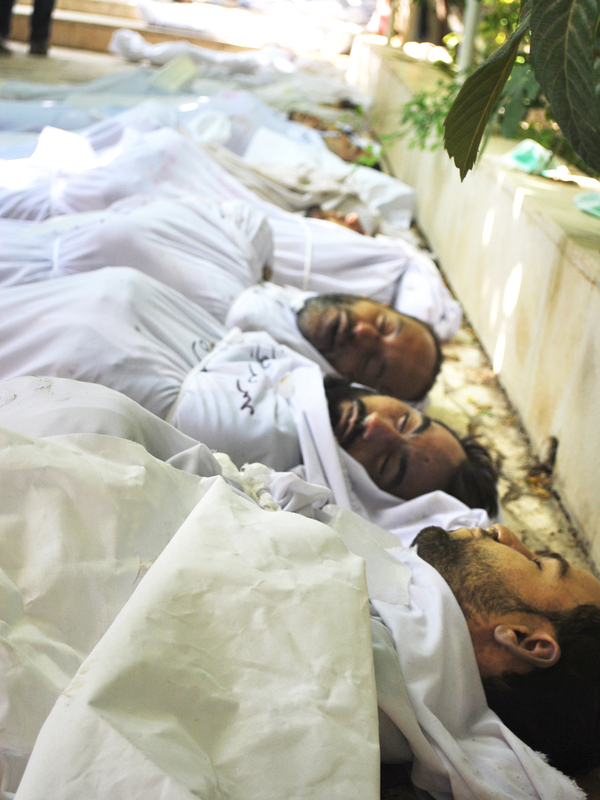 We discovered on the 21st of August 2013 that chemicals are not a red line." 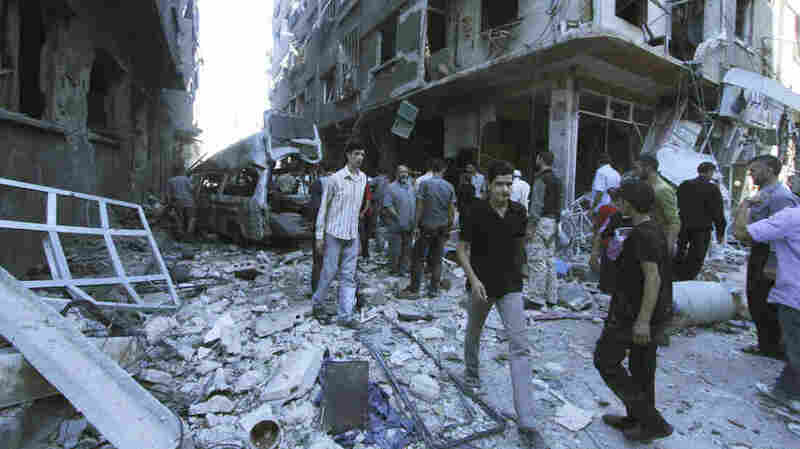 The Syrian government denied responsibility for the attack and blamed the rebels. The Danish ship Ark Futura arrives in the southern Italian port of Gioia Tauro on July 2, carrying chemical weapons material from Syria. 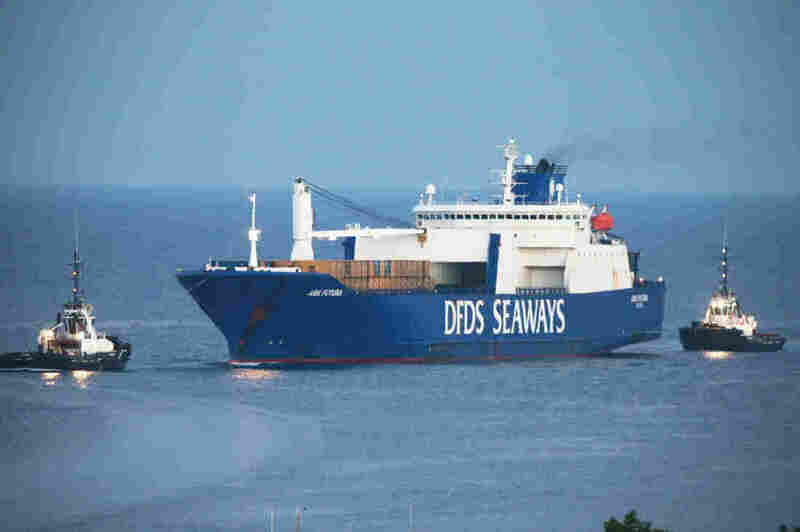 The material was transferred to the U.S. military ship Cape Ray and was destroyed in the eastern Mediterranean. The U.S. said this week that all of Syria's declared chemical arsenal has been destroyed. However, the government did finally acknowledge its chemical weapons stockpile and agreed to turn all of it over. The United States said this week that the entire declared arsenal, 1,300 tons of chemical agents, had been destroyed. Much of the destruction took place aboard the U.S. military ship Cape Ray in the eastern Mediterranean. Meanwhile, in Eastern Ghouta, life has only become more difficult for the survivors. Prior to the attack, the army imposed many restrictions. For example, residents were barred from taking in cameras. But afterward, a full siege was imposed on movement in or out of the area. And many staples, such as bread, flour and medicine, were not allowed in, Deek says. The United Nations ordered a probe that found "the government employs siege warfare, instrumentalizing basic human needs for water, food, shelter and medical care as part of its military strategy." The report, issued in March, said many besieged civilians in areas including Eastern Ghouta must choose between "surrender and starvation." The U.N. has managed to enter the area only a handful of times with limited supplies. One local activist and filmmaker, who is in Eastern Ghouta and asked that his name not be used, said via Skype that residents had some hope before the chemical weapons attack. But not afterward. There are 1.3 million people in Eastern Ghouta, he says, and they feel "all alone. They don't care anymore how the outside world looks at them because they see no hope." Residents are focused on day-to-day existence, relying on locally grown food and power produced by solar, animal manure and burning plastic. Without electricity, few have access to news of anything beyond their area. The activist says that few are even aware of the rise of the Islamic State in the north and east of Syria and in Iraq. The activist says that in the wake of the chemical attack, people began to accept more radical trends among the rebels. "They see no one is coming to help them but those people, as bad as they are," he says. "This chemical attack is not an anniversary for us. It's one [link] in a very long chain of big disasters that are still going on until now." Alison Meuse reported from her base in Beirut. You can follow her @AliTahmizian.